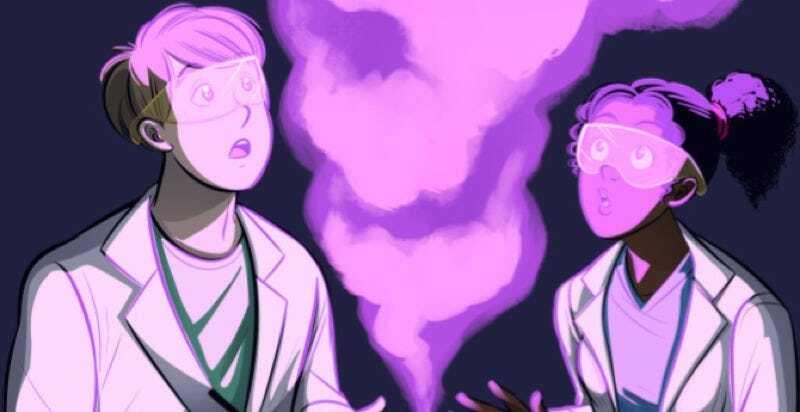 If you love all things science, you’ll probably be delighted by Boundless, the latest anthology conceived by the folks at Boston Comics Roundtable, a non-profit community of independent comic creators. “It’s the Boston Comic Roundtable’s love letter to science,” co-editor Jordan Stillman told Gizmodo. “Imagine a comics anthology full of informative, beautifully drawn, and engaging stories that are compelling in their depiction of the wonder of science.” Past anthologies dealt with horror, urban fantasy, romance, science fiction, and even food. This time around, there are 30 different stories from 40 different artists and writers—all with different styles—covering scientific processes, technologies, methods, and historical moments in a number of fields, including biology, medicine, neuroscience, physics, optics, and astronomy. Science is brimming over with fantastic concepts and stories, and Boundless provides ample evidence in its more than 200 pages. The anthology runs the gamut between the strange case of Phineas Gage—who famously survived an iron bar through his skull in 1848—and the mysterious neurological oddity known as prosopagnosia (the inability to recognize faces), to the black-capped chickadee, dark matter, the weird effects of relativity, and the science of fermentation. Editors Stillman, Olivia Li, Neil Johnson, and Heide Solbrig have turned to Kickstarter to cover printing and marketing costs, and to pay the contributors for their work. The plan is to have the book printed and ready for its debut at the Boston Comic-Con this August. The good news: They’ve already exceeded their modest $8,000 goal, with 10 days still to go on the Kickstarter campaign. So every additional dollar raised means the contributors will get paid that much more. A few sample pages from the proposed anthology are below; you can see even more here.